Comfort Foundation needs your support to minister to Russian orphans and underprivileged children. Here are some ways you can get involved with this ministry. Pray for the children we come in contact with at the orphanages and shelters. Pray for the protection of the health of the Russian staff and their families as they work in a very stressful environment. Pray for more Russian volunteers to give their time and resources. 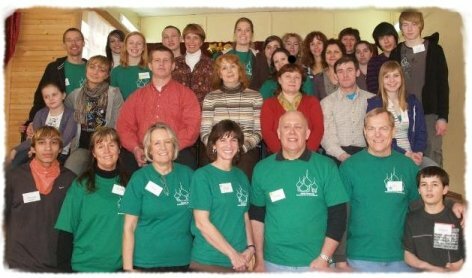 Your generous gift will provide our Russian staff members with monthly salaries and operating expenses so that they may continue to impact the lives of over 300 children each week. It will also help provide basic medical and physical needs for the children they serve. Please help us support these ministries by donating online here or sending your tax-deductible pledge or one-time gift to the address below. Preserve capital gains and reduce tax liability via a direct stock donation. Comfort Foundation is a recognized recipient in the matching gift programs at U.S. Bancorp, Monsanto, GE and Microsoft. If your employer has such a program, please check with them to see if your gift to Comfort Foundation could be matched. Use AmazonSmile when you shop online at Amazon.com and designate "Comfort Foundation USA, Inc" as your charity. For eligible purchases at AmazonSmile, the AmazonSmile Foundation will donate 0.5% of the purchase price to Comfort Foundation. Comfort Foundation regularly hosts events in the St. Louis, Philadelphia/Wilmington, and Cincinnati areas. Visit our events calendar to find an upcoming event in your area. Comfort Foundation representatives are available to come to your area and participate in fundraising events, missions conferences, small group meetings, and other opportunities to share the work of Comfort Foundation with interested individuals. Contact Sherri Holzhausen at sherri@comfortfoundation.org. Vision Trips: This is an opportunity to meet our staff in both Vologda and Cherepovets and to gain insight into their daily activities with the children and families that they work with. Contact Sherri Holzhausen for more information at sherri@comfortfoundation.org. There are opportunities throughout the year for individuals and groups to visit Vologda and/or Cherepovets to assist our Russian staff. For more details, contact Sherri Holzhausen at sherri@comfortfoundation.org. A trip to an orphanage in Russia is heart wrenching. The sheer number of children and teens wanting individual attention is overwhelming. There is a famine of appropriate touch. Visiting groups help our Russian staff touch children spiritually, physically and emotionally. The value of these groups to the ministry is priceless.